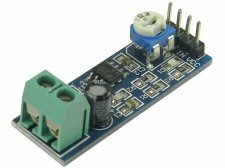 If your project needs an audio amplifier, this module should be useful. It is a miniature module for amateur projects. Simply connect a 4-8 Ohm speaker and amplify your sound. It can used with FM receiver kit or WTV020SD-16P music module. You can definitely use this module for other musical projects also.